Bergen Avenue runs a block east of Third Avenue in the Bronx from approximately 147th St. to 155th St. Henry Ahr, Railings was listed at this address (613 Bergen Ave.) in New York city directories from 1886 to 1890. This address was listed as his home as well as his place of business. Earlier, Henry Ahr, Railings, was located at Third Ave. corner of East 154th St. from 1876 to 1885. During this period the business was called Ahr & Son, the father being Anton Ahr and the son, Henry Ahr. Anton Ahr (1813-1909) was born in Germany and filed for naturalization in New York City 20 October 1879 when he identified himself as a machinist living at 142 East 4th St. Ahr & Son was in business from 1876 to 1885/86. In 1886 the two Ahrs went separate ways. Anton Ahr can be traced in city directories through 1909. From 1889 through 1909 he was located at 699-701 Elton Ave., the Bronx. Anton Ahr died 7 April 1909, aged 96 years (New York Times, 9 April 1909, pg. 9). Meanwhile, in 1886 Henry Ahr established his own business at 613 Bergen Ave., the Bronx, near East 152nd St. In 1891 Henry Ahr's business address changed to 698-700 East 148th St. This remained the address of Henry Ahr Iron Works through 1907. Then in 1908 the foundry moved west to 444 East 148th St. (near Brook Avenue) where they were in business until 1917. As of 2014 a modest two-story industrial building exists at this address. Henry Ahr (1847-1910) was born in Germany, and immigrated to the U. S. in 1866. A naturalization petition dated 17 October 1877, shows that he lived at 152nd St. and 3rd Ave., the Bronx, at that time. He appears in the 1880 U. S. Census, age 35, born Baden, living on 3rd Ave., the Bronx. He was also recorded in the 1900 U. S. Census, age 52, a widower, born Germany, December, 1847, living with four children, ages 15 through 23, all born New York. In 1904 Ahr applied for a passport where he stated that he was 56 years old and that he was born Auberampt, Pforzheim, Germany, 10 June 1848. He emigrated on the vessel McCury sailing from England, 20 June 1866. He also stated that he became a naturalized U. S. citizen in New York City, 17 October 1879. Ahr's death notice, New York Times, 31 May 1910, read, "Ahr - After lingering illness, Henry Ahr, beloved husband of Marie Ahr, in his 63d year. Funeral Wednesday, June 1, at 2 P.M., from his late residence, 1,897 Crotona Av., near 170th St. Interment Woodlawn." In 1914 this notice regarding sale of Henry Ahr's property appeared in the New York Times. 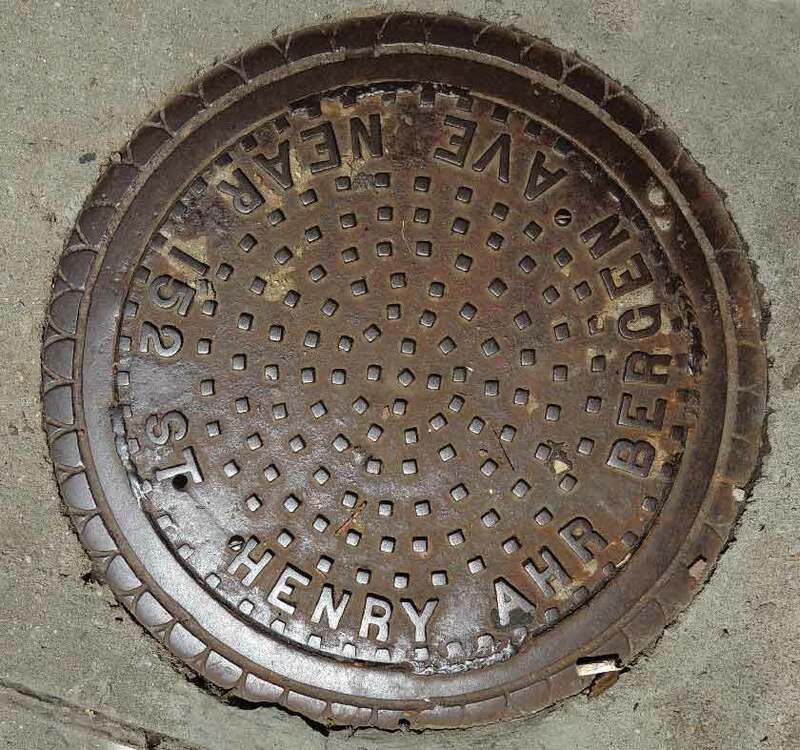 The sale including the site of the Henry Ahr Iron Works at 442-448 East 148th St.
Another Henry Ahr coal chute cover is found on West 137th St. This one reads, Henry Ahr Iron Works / 148 St. near Brook Ave. N. Y. This was Ahr's address approx. 1908 to 1917.